ASUS shows off its Taichi concept at Computex, it's a new type of laptop that offers two displays; the usual one on the inside and also one on the outside. 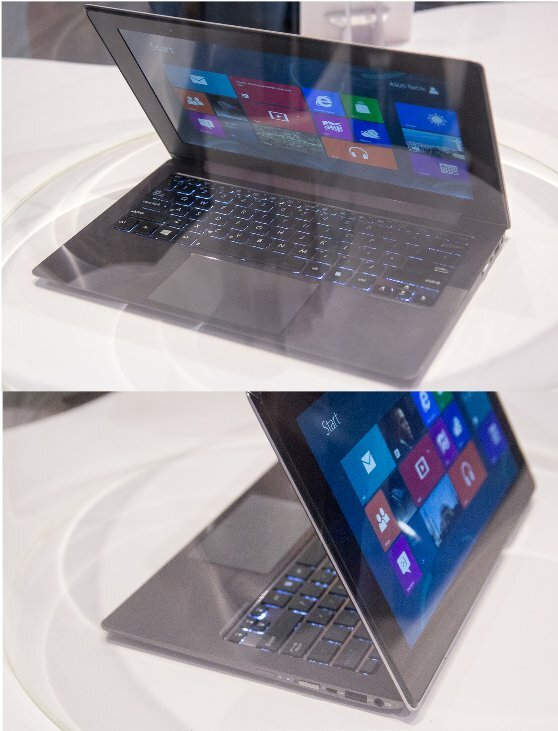 The one on the outside is a touchscreen, so you can use the laptop as a tablet when it's closed. Both screens are IPS-based and offer a resolution of 1920 x 1080 pixels. The company plans to introduce a 11.6" and 13.3" version of Taichi, but it's unknown when this product will hit the market. The ASUS TAICHI is a slim and stylish ultraportable with an astonishing double-sided LED-backlit IPS/FHD display. With a touch screen on the outside of the lid, the TAICHI opens up a whole host of new mobile possibilities as it plays the role of both notebook and tablet. With the lid open, it's just like any other notebook computer, but with the lid closed the TAICHI instantly becomes a multi-touch tablet computer with stylus support. Better still, the two screens are completely independent of each other and can be used simultaneously for a host of innovative new applications. Available in both 11.6" and 13.3" screen sizes, the TAICHI is as light and thin as the ASUS ZENBOOK™ and delivers uncompromised mobile performance, with 3rd generation Intel® Core™ processors, fast SSD storage and dual band 802.11n Wi-Fi.